So I know I mentioned enjoying comics by Brian K. Vaughan because he is able to work in social and current issues that are often not dealt with in comic books, but I also am thoroughly entertained by the basic plot of his Ex Machina stories. 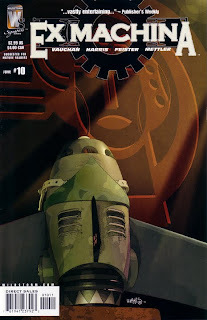 Ex Machina #10 concludes the "Tag" tale which involves the only connection to Mitchell Hundred, a.k.a. the Great Machine, and him receiving powers that allow him to talk to machinery. The connection is a symbol on some scrap metal that was found by where the powers were originated. The symbol itself speaks differently to different people, and as we find in Ex Machina #10, it speaks with much evil intent. The story wraps up a mystery involving a family in Hundred's past who are turning up dead. Vaughan does a great jump of keeping the identity of the killer involved secret until the final issue, which makes the build up much appreciated. The pay off is a machinery talking battle! "When I say one, you say zero! One!"